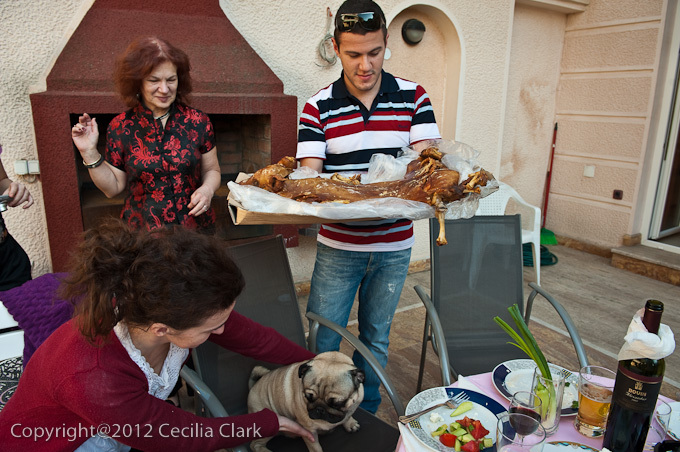 This afternoon, we went to a pig roast dinner. Our landlady, Olivera, invited us. 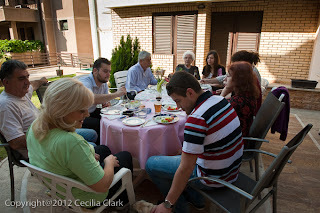 The dinner was with Olivera, her mother Tatiana, her brother Andre, her boyfriend Tana (a champion chess player), and their neighbors. The weather was warm and lovely. We ate outside and it felt like a picnic. 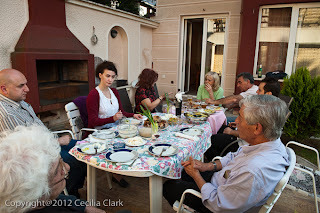 First we had salads, a white cheese from sheep, another white cheese from cow, and Ouzo as an aperitif. After salads, the main course was brought out. The young pig had a golden brown crispy skin with the meat falling from the bones. The pig had been purchased from a village outside of Skopje. It was butterflied, baked for about 10 hours, and delivered fully cooked to our hosts. It was a most unforgettable, amazing meal.